Hello, party people! We made it to another Friday (thank heavens). Yesterday was the first day of Fall, officially, and I could NOT have been more stoked. One of the things I was looking forward to most this season was decorating my little apartment! I grew up watching my mom decorating our home with beautiful fall decorations and honestly, I was so spoiled. Our home was always beautiful, always put together. I want to do that for my husband and our future family! 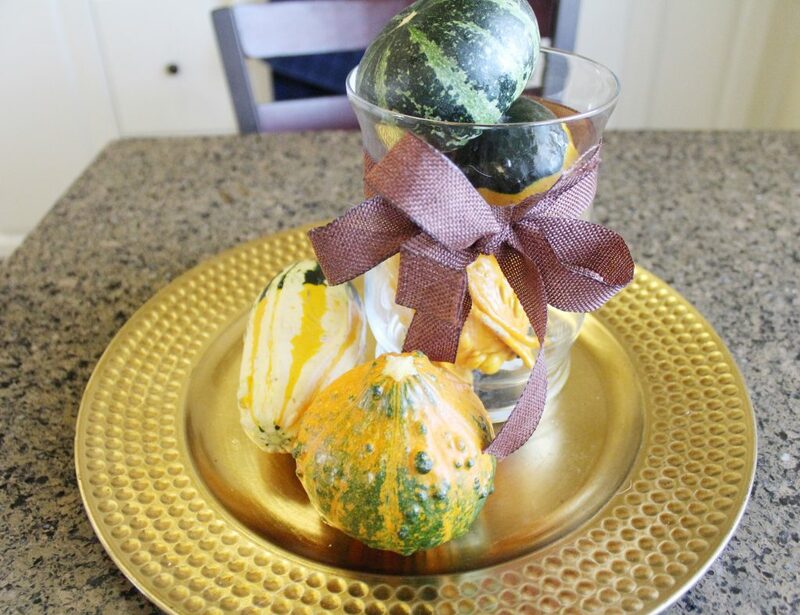 I wanted to show you the pretty DIY table decoration I made (and also: it cost less than $10). SO. Let’s do this. So I already had the burlap ribbon and the large plate (but I am sure they don’t cost that much at a craft store). I bought the glass vase for 3.50 and the little baby gourds for $2.97. So cheap but so cute! Arguably the most important part of this little centerpiece is the bow on the front! I thought that a regular bow would be too small, so I got fancy and did a bigger one! It is super easy to achieve this look! All you have to do is cut a piece of ribbon long enough to tie a bow (it’ll just be like a free bow, don’t tie it to the vase yet). Then, cut another piece of ribbon long enough to go around the vase. Tie it one around the vase, then put the free bow right in the center of the first tie you made. Next, tie a bow around the free bow you placed in the middle. Fluff out the ribbon pieces and angle it the way you think looks best! So easy, and looks way more complicated than it actually is. 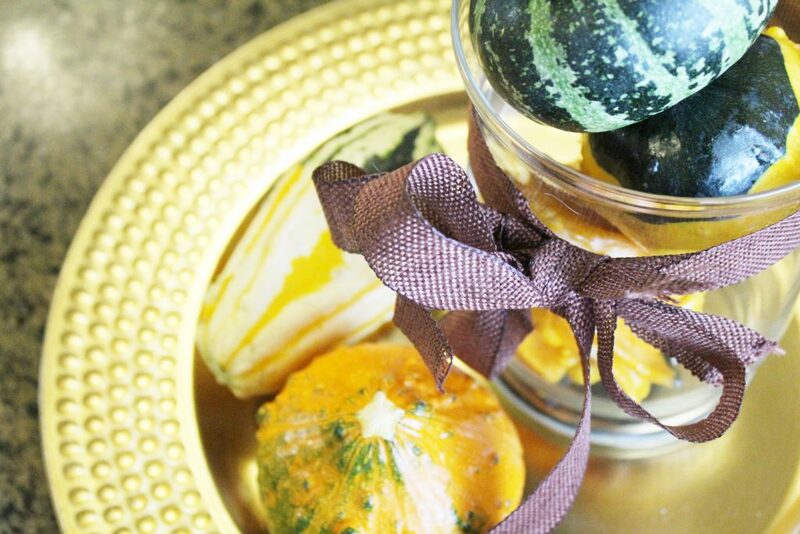 Now that your vase is done, choose the three smallest gourds you have and arrange them inside the vase. 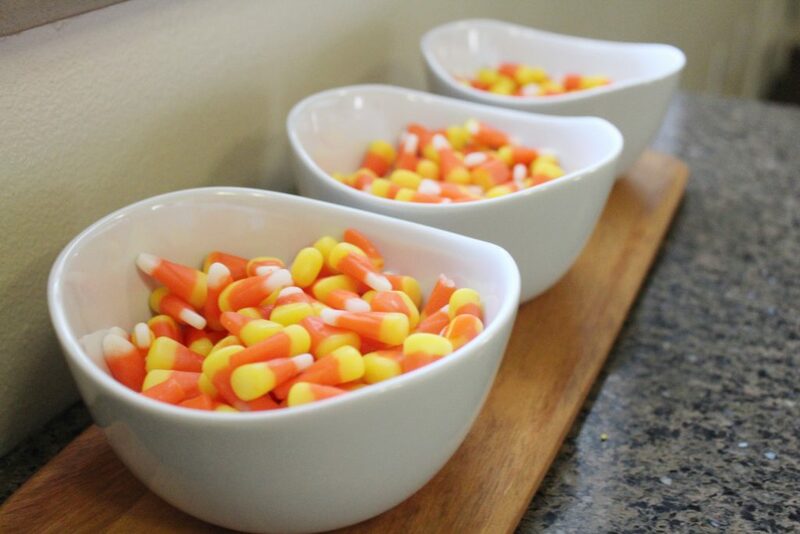 With the last few, arrange them outside the vase, on the plate! It would be perfect on a coffee table! I don’t have one of those, so I have mine on the end of my kitchen table. Hopefully you liked this post and little tutorial and are able to DIY some fun fall decorations for yourself this year! 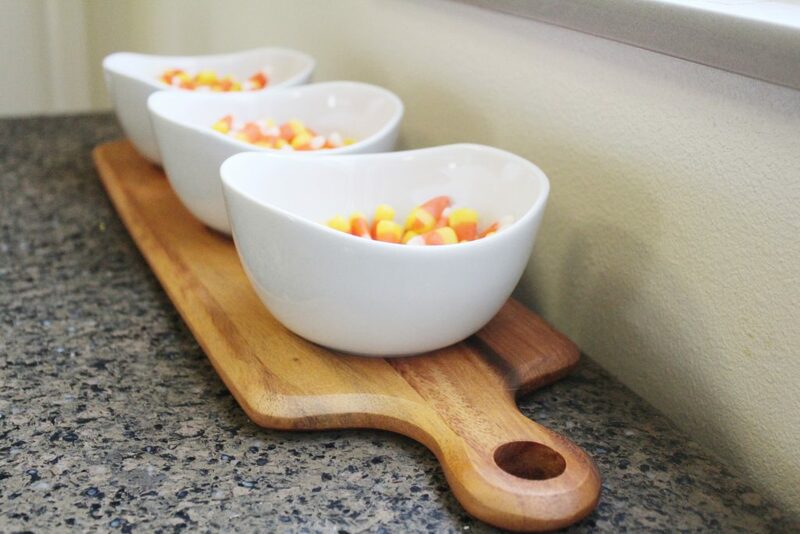 What are some of your favorite ways to decoration for the season? I think I am going to attempt a wreath next! I love this amazing time of year — and halloween is JUST around the corner. I AM SO EXCITED. You guys aren’t going to believe what I have in store! ALSO: I designed some really cute fall printables for all of you! Just click the link to view and download whichever one you want They are perfect to stick in a little frame and place on an end table! Thanks for stopping by, and I hope you learned something new today Happy Fall, Y’all.